If you’re heading to the hills in spring, summer, autumn or winter in the UK, getting the best waterproof jacket for your particular needs is key. Be it light drizzle or a torrential downpour, chances are you’ll soon find yourself faced with rain. In fact, out of all the types of technical attire out there, an all-weather jacket is the one piece you’ll rely on time and again. Invest in a high-quality, high-performance one and it should last you a long time too. The best waterproof jackets keep you dry when it rains, and are also breathable for those times when you’re active. But one kind of weatherproof shell doesn’t fit every scenario – different jackets address different needs, which is why we’ve featured a broad range in our buyer’s guide. Some of them are more packable than others, some more breathable, and some more waterproof. Each jacket uses a range of technical materials to get the job done. Purchasing a good hard shell which will stand up to the rigour of a day's worth of rain isn't as straightforward as it might seem, though. First of all, you need to get to grips with some overly-technical terms, such as Gore-Tex, Polartec, and rain flap, and then you need to figure out what you're going to be using your rain jacket for... other than staying dry, that is. If you'll be climbing up some Great British hills then check out our guide to the best hiking boots and take a look at the Canada Goose Alderwood Shell, if you're trail running check out our favourite trail running shoes and the INOV-8 Race Ultra Race Shell HZ U, and if you're commuting why not take a look at the best backpacks around plus the North Face Men's Fuseform Eragon Wind Jacket. We've also got some brightly coloured options that might be a smart choice on long hikes up a mountain, especially if you're often a lone ranger, and two of the best waterproof jackets from one of our favourite eco-friendly friends. 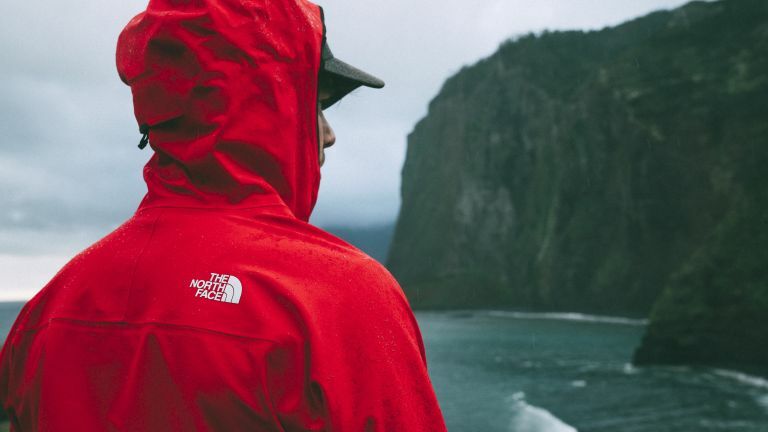 The North Face has seriously upgraded its infamous Apex Flex GTX Jacket to create a much lighter, more stream-lined waterproof jacket. In fact, at first glance, you could mistake it for a snug hoodie. While it boasts a tough three-layer Gore-Tex shell for superlative wind and rain protection, the soft-knit outer fabric is luxuriously soft. The stretch-knit liner also feels great against the skin, acting like a thin fleece for enhanced warmth, and giving you all the cosiness of a hoodie. Although lighter than its predecessor – TNF shaved off 40g of the original's weight – the Apex Flex is still hefty at 800g. Breathability is great, though, and pit vents further aid cooling, so we forgive its heaviness. As you'd expect from such a design, the fit is nigh-on perfect, staying close to the body in all the right places, without ever feeling tight or restrictive, even when worn with other technical layers. The super-light construction of the Apex Flex GTX also helps you stay nimble as you cross challenging terrain. This, combined with expert wind and rain protection, makes it the best waterproof jacket for outdoor explorers and for those of you who enjoy being active outside. When it’s really throwing it down and you’re at the start of a multi-day adventure, the highly breathable Columbia OutDry Ex Reign will keep you dry and protected from the worst of the wind and driving rain. Fully seam sealed, Columbia’s robust waterproof jacket will keep you dry in anything short of complete and utter immersion. The Reign is designed with a large storm hood that’s fully adjustable, depending on the fit you want to achieve, along with adjustable sleeve cuffs and a drawcord hem, enabling you to keep every drop of rain out. There’s underarm venting to keep you cool on the move, plus useful zippered hand pockets, which you could keep small outdoors tech in. The clue to this jacket’s purpose is in its name: the Minimus is, erm, minimal. At just 140g, it’s over a fifth of the weight of the The North Face offering. Its three-layer Pertex Shield+ laminate, which combines with a seven-micron breathable membrane, might be wafer-like, but offers excellent water resistance as well as ample sweat-wicking. This high-performance waterproof jacket can also be scrunched up to the size of a tennis ball and stowed away in your backpack when not needed. The Minimus 777 is perfect for arduous Alpine activities, as its articulated arms, toughened seams and under-helmet hood make it particularly well-suited to rock climbing. With its roots firmly in sailing, Musto knows a thing or two about dealing with adverse weather conditions and waterproofing. It also knows how to make functional look appealing, which is probably why the Duchess of Cambridge wears one. The XVR BR1 offers outstanding waterproof protection, is breathable and can be paired with combined with a XVR Primaloft Dock jacket when the conditions get really cold. Why do we say outstanding waterproof protection? For a garment to be deemed waterproof, industry standards require 1,500mm of water to be able to sit on the fabrics surface for 24 hours before it starts to leak. The XVR can take 5,000mm. Arc’Teryx's best waterproof jacket contender is a three-layer design with high-end Gore-Tex Pro innards. It feels bombproof, which it nearly is thanks to a toughened exterior that withstands scrapes and tumbles. More importantly, the Beta AR makes the cut here because of its enhanced waterproofing and impressive breathability – added armpit zips keeps thing fresh and breezy when you're really trekking hard. Although durable, this windproof jacket is surprisingly light for a three-layer, and it’s roomy despite the athletic fit, which is able to accommodate a helmet under the hood. Get over the price tag and you'll find a very capable all-weather jacket for outdoor pursuits. Like many of Patagonia’s ethically produced garments, the Torrentshell is made of recycled fabric. Unlike Columbia’s effort, it doesn’t feel like it. A conventional 2.5-layer H2No fabric houses a breathable and waterproof membrane, topped off with a DWR finish. You don’t get the same sort of protection as a three-layer type jacket, but the Torrentshell’s 343g weight is light(ish) and packs down small. The fit is fine, and breathability is aided by pit zips, but this is one for casual country walks, not epic hikes. As such, it also looks at home in more urban environments. The design is fuss free, with an adjustable hood that sits nicely over beanie hats. There are also two large zipped hand pockets to stash your essentials while on the move. The Berghaus Hillwalker comes across like a modern take on the wax cotton jacket, and suits leisurely rambles in the countryside. Mild-mannered, sure, but you get top-notch waterproofing and breathability thanks to Gore-Tex. As a two-layer type, the performance isn’t on par with a three-layer, but what you do get is a light insulated lining, big front pockets and soft-lined hand-warmer pockets, which is what you want when you’re out in the cold. The downside? The sleeves could be longer, but then that depends on how long your arms are. The Hillwalker from Berghaus can withstand tearing and abrasion that bit better than conventional lightweight jackets, and sports taped seams to keep you dry and on drizzly walks. The Mammut Masao is a lightweight and technical water-resistant jacket with a Drytech Premium 3L shell. The coat features underarm pit zips, which enables you to dump any excess heat quickly while on the move without sacrificing water protection. The Masao can be folded into an incredibly compact package, making it a great companion for various activities. This waterproof jacket from Haglöfs is for trekking, offering well balanced features and performance. Fully featured, and built in lightweight Gore-Tex 2L fabric, this is perfect if you're walking hills and smaller mountains. The hood has a laminated, wire-reinforced peak to keep the rain out of your eyes, too. This iconic design is has been protecting fishermen in the coldest of seas in all kinds of weather. The lightweight jacket has welded seams and is made from Helox+ (100% polyurethane) waterproof fabric to fend off storms. What's more, the bright yellow keeps you visible during the most apocalyptic conditions. Weighing in at 340g, with our new best friend Pertex Shield 2.5 layer fabric in its corner, the Downpour Plus from Rab disperses rain along its surface for quicker evaporation. There's a fleece lined chin guard, and the left pocket doubles as integrated stuff sack. The Sten is a comfortable jacket made with durable G-1000 and G-1000 Lite fabric. It's a practical everyday garment that also works well in nature. It can be waxed for added protection from wind and rain. If you want to go one step further into the realms of sustainable, environmentally friendly outdoor gear, look no further than this Fjallaven Eco Shell. Completely wind and waterproof, this jacket is made up of three layers to keep you warm and dry in changeable weather conditions. The hood is adjustable, with room for a helmet, making this a great choice if you're looking for a waterproof jacket to keep you dry whilst enjoying cycling, or other active pursuits. It's made from recycled polyester and is PFC (a water repelling compound that doesn't break down) free, making it the best waterproof jacket choice for the environmentally conscious. Instead, Fjallaven use DWR. While it won't win any awards for technical innovation, Tog24's simple waterproof jacket is all you need in a shower. It might not have the super-technical functions of the others garments on this list, but it looks good and can be worn in urban environments as well as natural ones. The waterproof, breathable and windproof ripstop fabric features a mesh-and-taffeta lining, as well as a rollaway hood with fused peak for extra protection. Made for trail runners, this is the lightest jacket INOV-8 make, coming in at a featherweight 125g. That's less than something that weighs 126g! The fabric is transparent so your race number remains visible, and it can pack away into the hood. Canada Goose is well known for its Arctic down jackets, but the Riverhead is a lightweight coat which will protect you from wind, rain, sleet, or even light snow. The new S18 design has been crafted from Strati-dry 3L three layer fabric. It features a two-way adjustable hood, suede lined pockets, underarm venting to enhance, and adjustable cuffs with snap closure. At just 87g, this is one of the lightest waterproof hard shell jackets we know of, allowing you to pack it down to almost nothing and carry it at all times - perfect for minimal adventures. This low weight doesn't sacrifice its water-shedding abilities, with 15D ripstop nylon fabric and Z-Grav technology built in, which combines waterproofing and breathability to take care of any water, whether it's on the inside or outside. Norwegian-born Odlo designs its gear to suit a variety of outdoor activities - erring on the sporty side - and its latest jacket, the Air Minimal, is just that: perfect for any occasion where you're working up a big sweat, such as running or cycling. It has a high level of waterproofing thanks to Pertex, so it's able to quickly wick away moisture so you don't feel clammy. Built to protect you during torrential downpours, the Helium is lighter than air - see what they did there? Made from Pertex Shield+ fabric, which is breathable as well as a water defender. It folds into its own tiny, 180g pouch with a carabiner for attaching to packs or harnesses.